It’s Valentine’s Day, and in lieu of our usual post touting different ideas for celebrating love in a puzzly way — since it’s a bit short-notice for those ideas — we thought we’d share some of our favorite tales of puzzle romance. In the past, I’ve had the privilege of reporting on two puzzly proposals that were quite brilliantly facilitated by our friends at Penny Dell Puzzles. Each time, the gentleman in question — both times named Bryan, oddly enough — asked that the proposal be hidden in a favorite puzzle, slipped into one of their puzzle books. The first time, it was Escalators, the second, Simon Says. Both times, the plans were executed to perfection, and both times, the lovely fiancees-to-be said yes. Carol and George are one of those brilliantly matched couples that makes you smile just thinking of them. Marvelously compatible interests and senses of humor and general weirdness that makes relationships worthwhile. George had several gifts picked out for Carol, but he wanted to surprise her with a little something extra, a bit of diabolical sweetness only a true puzzle devotee would love. 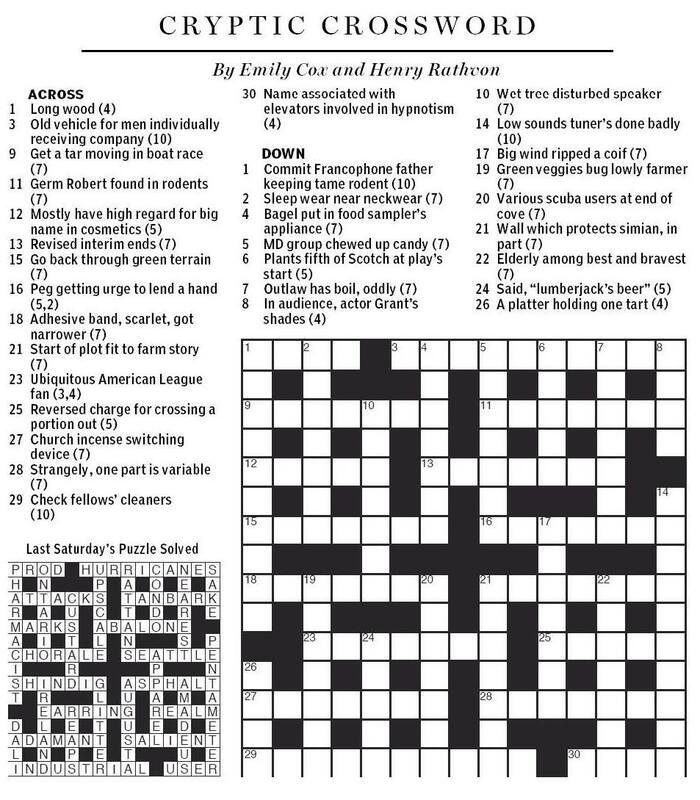 So, before Carol received each small token of affection, she was given a cryptic crossword (also known as a British-style crossword) clue to solve. Cryptic crossword clues involve both cunning wordplay and a definition. The number after the clue provides the number of letters in the answer word. Here are the clues George created. Hopefully you can figure out the answers just as Carol did! Hopefully, there will be some wonderful new stories of puzzle romance to come. Maybe even tonight! If you have a story to share, comment below! We’d love to hear it! This entry was posted in Games, PuzzleNation, Puzzles and tagged crossword, crosswords, cryptic, cryptic crossword, DIY puzzling, Escalators, games, Geeking Out, Holidays, Monopoly, Penny Dell Puzzles, Penny Press, Pop culture, proposal, puzzle love, puzzle proposal, Puzzle romance, Puzzle to solve, PuzzleNation, Puzzlin' fool, puzzly proposal, puzzly romance, romance, Rubik, rubik's cube, saint valentine's day, Simon Says, Valentine, Valentine's Day, Wordplay by gmdirect. Bookmark the permalink.